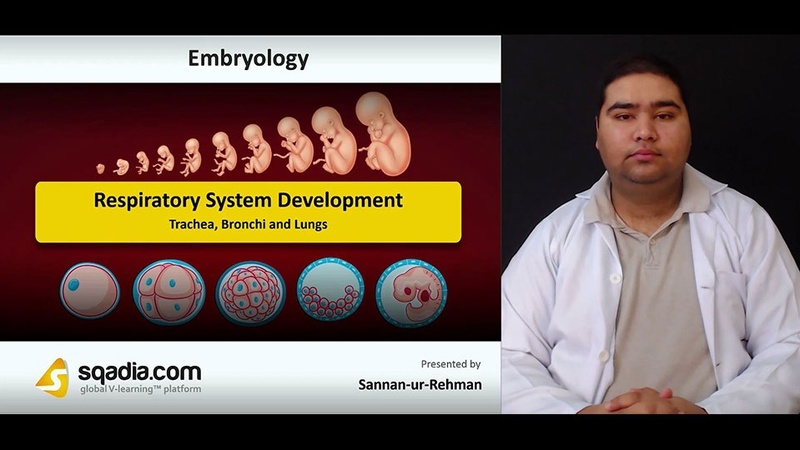 The following lecture presents detailed information on the topic of Respiratory System Development. Section one of this lecture focuses on Formation of Lung Buds. The educator presents an overview of Development of Respiratory System in the beginning after which process of Formation of Lung Buds is thoroughly demonstrated. In section two, the prime focus is Larynx. First of all, the educator extensively discusses the whole process of formation of Larynx in a step by step manner. Subsequently, the topic of Laryngeal Stenosis is brought under consideration followed by an elucidation of Laryngeal Web. Section three is about Trachea, Bronchi and Lungs. First of all, the educator delivers significant information regarding the formation of Trachea. Afterwards, the concept of Bronchi is clarified followed by an explanation of Bronchi and Lungs. At the end of this section, light is shed on the development of Lungs. In section four the concept of Maturation of Lungs is clarified. In the start, the educator presents a detailed overview of Stages of Maturation of Lungs. Subsequently, Canalicular Stage is comprehensively demonstrated followed by an extensive discussion on Fetal Breathing Movements. Section five focuses on the Clinical Correlations. The educator sheds light on numerous Clinical Correlations associated with Respiratory System Development such as Tracheoesophageal Fistula, Respiratory Distress Syndrome, Abnormal Lobes of the Lungs, Ectopic Lung Lobes, and Azygos Lobe of Lung.